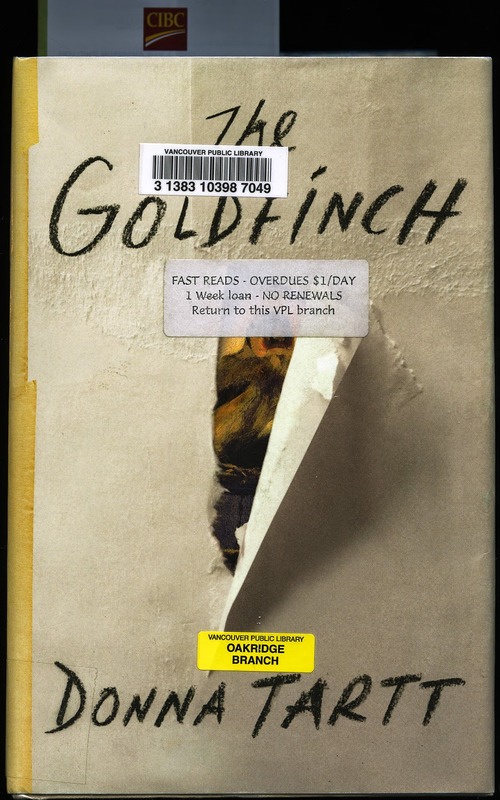 Donna Tartt’s The Goldfinch is available at the Vancouver Public Library. They have 63 copies and 521 holds on it. Consider that this Pulitzer Prize winning novel packs 771 pages. I wonder how long I would have to wait if I put a hold on it now. The fact is that last Monday when I went to my Oakridge branch there was The Goldfinch as a one-week-fast-reed staring at me and daring me to take her out. I did. The young librarian said to me (with a perverse sort of smile), “As I see it you will have to read 100 pages per day. If you return it late Monday night after we are closed it will still be seen as returned on time. It is Sunday night and it is 10:55. I am on page 400. I believe I might read 100 more pages tonight. My scenario, my logical scenario is that I will finish it by Wednesday and will owe just a couple of bucks. This novel is very good (that sounds lame so I will then just say that it is very, very good). It is the perfect book to be reading close to and on Mother’s Day because the protagonist, when the novel begins, is 13 years old and he has an especially close relationship with his mother. To escape a rainstorm they go to the Metropolitan Museum of Art in NY City. There is a terrorist bomb that explodes inside and our protagonist’s mother dies. The novel is really about how this boy handles his loss. I was very close to my mother because like Theo Decker my father left the house when I was almost (younger in fact) Decker’s age. On most days I remember my mother especially when I look at my youngest daughter Hilary or her youngest daughter Lauren. Both resemble my mother. On a day like today I always feel that guilt that every son from time immemorial must feel about not having told one’s mother, “I love you,” enough times. Or worse still to remember situations when I had been unkind. I want to shower my mother’s two doppelgängers with as much kindness as I can muster for my past failings. I have a feeling that I am not alone in this but that I am lucky to have that pair to keep the memory of my mother alive within. Where Have You Gone Husker Red?